Leaders, including Ford Foundation president Darren Walker and actress Phylicia Rashad, convened to discuss the Action Fund. 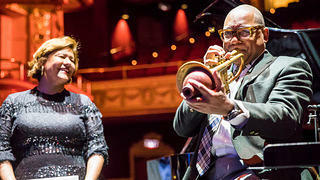 President of the Andrew W. Mellon Foundation Elizabeth Alexander enjoys a performance from jazz musician Wynton Marsalis. A community of America’s thought leaders and cultural influencers convened in New York City on March 28-29, 2019, to articulate an innovative agenda for preserving African American history and stories as an engine of social justice through the African American Cultural Heritage Action Fund. In partnership with The Andrew W. Mellon Foundation, Ford Foundation, and The JPB Foundation, the summit capitalized on the national spotlight and momentum around the Action Fund to create a nation where all Americans see their stories, history, and potential in the African American historic places that surround us. 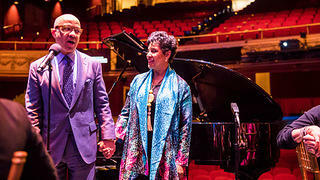 Action Fund Advisory Council co-chairs Darren Walker and Phylicia Rashad kicked off an evening of music and conversation at the historic Apollo Theater, with jazz legend Wynton Marsalis and Action Fund Advisory Council co-chair Elizabeth Alexander, president of The Andrew W. Mellon Foundation. What followed was a day of dynamic and inspirational dialogue with a think tank of leaders from every sector—the arts, business, policymaking, academia, preservation, and more. We explored a forward-looking future and the role of cultural entrepreneurs, arts activists, preservation philanthropists, students, filmmakers, playwrights, and other new voices in shaping and defining our emerging social movement called the African American Cultural Heritage Action Fund. From our panelists and moderators like Richelieu Dennis, Linda Wilson, Adam Pendleton, Daniel Beatty, and Yoruba Richen, to the next generation of cultural preservation professionals, to the Action Fund Advisory Council members Sherrilyn Ifill, Henry Louis Gates, Jr., Evelyn Higginbotham, Irvin Henderson, Rep. Terri Sewell, and Dana Bourland, these and other speakers made this landmark event a success. They continue to inspire and motivate new forms of partnership, interpretation, and community. The African American Cultural Heritage Action Fund is the largest nonprofit campaign ever undertaken to elevate and celebrate African American history in the places where it happened nationwide. The Action Fund is investing $25 million to save the places where African American artists, activists, and achievers of every generation made their mark and moved us all closer to America’s founding ideals. An esteemed National Advisory Council of America’s most respected and penetrating thinkers and leaders guides and directs this effort. Learn more about the Action Fund. On Monday, February 25, 2019, executive director of the African American Cultural Heritage Action Fund Brent Leggs spoke on Good Morning Washington about a new documentary from the Smithsonian Channel, The Green Book: Guide to Freedom. During the segment, Leggs took a brief look at the history and legacy of the Green Book travel guide, as well as the work that the National Trust is doing to preserve places of African American achievement, activism, and community. To learn more about the documentary (premiering tonight on the Smithsonian Channel) and the National Trust's work tell the stories that have long been ignored, watch the video. Then, take the pledge to tell the full history. On Wednesday, February 13, 2019, executive director of the African American Cultural Heritage Action Fund Brent Leggs spoke as part of a Today Show panel about a new documentary from the Smithsonian Channel, The Green Book: Guide to Freedom. During the segment, Leggs and his co-panelists, including documentary director Yoruba Riche, Emmy Award-winning journalist Carol Jenkins, and public health expert Dr. Henrie Monteith Treadwell, took a brief look at the history and legacy of the Green Book travel guide. To learn more about the documentary and the National Trust's work to tell the full history of African American people and places, watch the video. Today, while many historic places are remembered for their national importance, others have not been fully acknowledged for the role they play in the fabric of American society. When we share these places’ stories with the world, we amplify the voices of those who have been historically silenced. We ensure that every American can see themselves, their history, and their potential in our collective story and in our national landscape. Tia Mowry-Hardrict, Aldis Hodge, Marcus Scribner, and Phylicia Rashad are united by the places that matter to them—from a childhood church to a tiny Afro-Caribbean neighborhood in Miami to an elite educational institution for African Americans to the Lorraine Motel, all of these places contribute to America’s full history. Learn more about these places and find out how you can get involved through the video below. If you or someone you know has a historic place such as a site, museum, or landscape representing African American cultural heritage, you'll want to submit your Letter of Intent for the African American Cultural Heritage Action Fund. From capital projects to organizational capacity building, there are many ways that you can put this funding, ranging from $50,000 to $150,000, to use within your community. In 2018, the National Trust awarded $1.1 million to 16 projects. Letters of intent for the program are due January 15, 2019 by 11:59 pm local time.